On December 2014, we released our first paid plans. Those plans allowed our users to get a certain number of private projects. At that time GenMyModel still only supported UML. In the past two years, GenMyModel has evolved from a simple UML modeler to a fully fledge Modeling Platform. We added features like custom generators, pdf reports, model history and versioning. We introduced several new editors (BPMN2, JPA, Database, Flowchart, EMF and DMN). Some of those new editors got specific features, like process animation for BPMN2. With all these changes, our old pricing designed solely for UML didn’t fit anymore. Users that use BPMN are different than the one that use UML. It didn’t seem fair to make every user pay for all our products if they only needed part of the platform. Today, we are introducing a new pricing on GenMyModel. We worked hard to make the new plans as flexible as our platform. For Team and Enterprise plans, you will also be able to select the number of users you wish to include in your plans. Each user will have it’s own personal GenMyModel account. 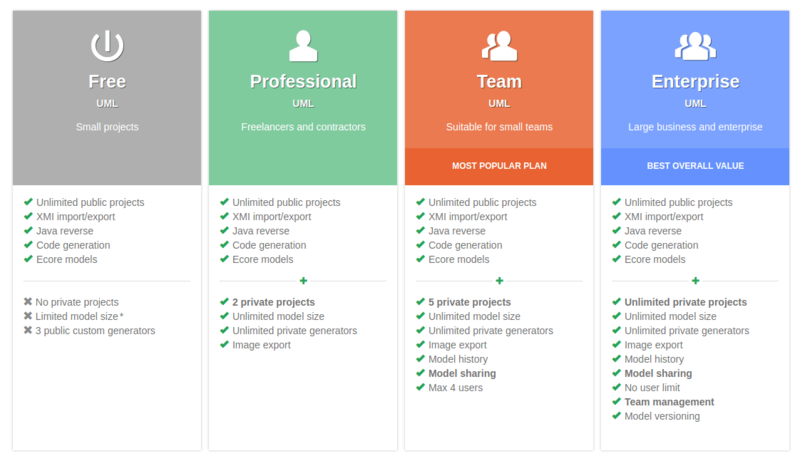 All users on the same plan can collaborate and share projects among each others. The new pricing will only apply to new subscriptions or subscription changes. If you are already subscribed, nothing will change for you. You’ll keep your current plan, with its price, limits and features until you choose to unsubscribe. As we worked to redesign our plans, we also looked into improving our Free plan. The Free plan used to be quite limited. It only allowed for 20 objects to be created in any given model. We changed that for a complexity based approach. Now only the main elements in your diagrams are taken into account. In UML for example, attributes and operations are now no longer counted towards the limit. This allows you to design models for real use-cases, letting you try our platform fully before committing. If you reach the limit on one of your models, you will still be able to make modifications to it, but you won’t be able to add more elements. This way you can clone any model from our public repository and play with it, even on the Free plan.